This week was quite interesting, by far my favorite week–thus far (hoping next week will top this). 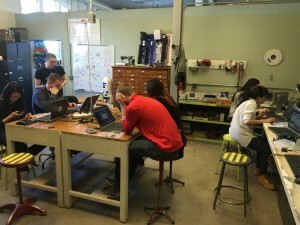 This week we got to go to the Fab Lab over on the Urbana side of campus. The Fab Lab (short for fabrication laboratory), is specific kind of makerspace. 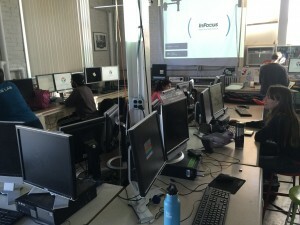 The Fab Lab in an advanced workshop for rapid prototyping and designing using various machinery and computer-aided designing tools. The space is community driven by people referred to as Makers. The Fab Lab encourages people to become makers by exploring the entire design process. This was my first time visiting the fab lab and it was amazing. Our visit started off with an overview on what the Fab Lab is about and all the services and opportunities it provides. From there we were split into groups of 3 and given tours of the space. The space is sectioned into roughly 3 areas; electronics, fabrics, and computers. After given tours of the space we were able to work in the area of our choice. Given the nature of my project and because of my general interests, I ended up in the electronics section. 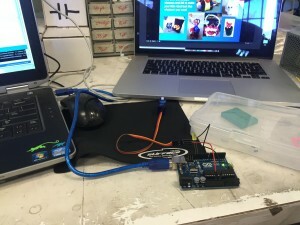 In this section, our instructor Colton was able to teach us all things arduino. 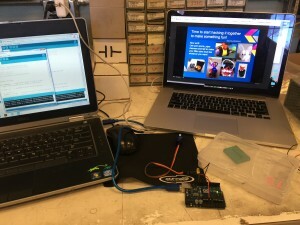 Through the session we were able to interact with the Arduino Interactive Development Environment, actual arudinos, lightbulbs, and other bits of electronics. The result of our session was a arduino powered lightbulb and motor that functioned with responses to our touch. I LOVED IT. I loved it for a couple of reasons, firstly, because I’ve never really interacted with hardware before. 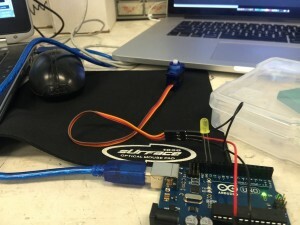 I’ve written code which eventually interacted with hardware before (haha), but I haven’t had the opportunity to work directly with the hardware. The other reason why I loved it is because of the potential learning more about this topic would holds! From this session, I gained the confidence to go ahead with my semester project and even felt comfortable with joining in another project with my fellow classmate Steve Koziel! I am excited with what the next couple weeks will bring and produce! Here are some pictures of the Fab Lab and my work. This entry was posted in Reflections, Week7 by Toheeb Okenla. Bookmark the permalink. First off, let me say you’re the best!!! Thank you for helping me out and answering all my questions 🙂 Glad to hear that you gained confidence to go ahead with your semester project and also help out Steve!! I’m glad you had a lot of fun at this workshop. I had an awesome time at CU’s Fab Lab as well, but let’s make next Monday’s visit even better! Funnily enough, I first heard of the term Arduino through you. It was when you were pitching your project idea to the class, which I thought was dope! I would definitely invest in a product that allows me to control my lights through an application on my cellphone. How would you have gone about creating this? Also, I think it is really cool how you’ve written lines of code that eventually interacted with hardware. What programming language did you use and what did the program do? Lastly, I want to say that I’m glad you gained the confidence to go ahead with your project and join another one. Can’t wait to see what’s in store with your creations! Definitely agree with you! The electronic lab is interesting and a good learning opportunity for me. BTW, thanks for helping me fixing the code to make my motor work finally. This is also my first time to officially write codes to control some hardwares.